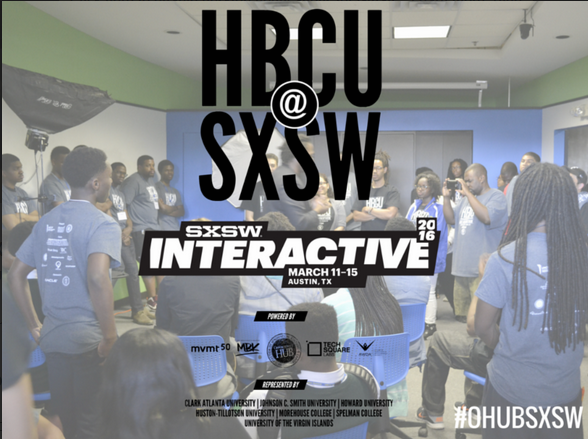 March 8th, 2016, Atlanta, GA – The South by Southwest Interactive Festival announces a new partnership with Opportunity Hub, MVMT50 and several Historically Black Colleges and Universities to bring high potential student technology entrepreneurs to this year’s 2016 Interactive Festival, during the timeframe of March 11 – 15, in Austin, TX. This effort is designed to support President Obama’s My Brother’s Keeper initiative, which was launched to address persistent opportunity gaps facing boys and young men of color and ensure that all young people can reach their full potential. This year’s inaugural cohort will maintain a rigorous daily itinerary in which the student entrepreneurs will maximize their opportunities to learn, network and engage with some of the world’s top innovators, entrepreneurs and investors. Students will participate in a Hackathon, attend SXSW workshops, panels, and conversations and pitch competitions; and network at events scheduled at The District of Columbia’s #WeDC House and the City of Atlanta’s #ChooseAtl House. A 2015 report from the White House Council of Economic Advisers explores the barriers that disadvantaged youth face, particularly young men of color, and quantifies the enormous costs this poses to the U.S. economy. In particular, this report focuses on the significant disparities in education, exposure to the criminal justice system, employment and access to opportunity that persist between young men of color and other Americans. Opportunity Hub, inspired by MBK, worked to encourage the innovation and entrepreneurial directors at many of the Historically Black Colleges and Universities (HBCU’s) to look at SXSW as an important opportunity to expose their students to tech, STEAM and startup ecosystem and the opportunities for internships, connections and mentorship. At the time of this release, students from Morehouse College, Spelman College, Clark Atlanta University, Howard University, Johnson C. Smith University, University of the Virgin Islands and Huston-Tillotson University are confirmed to participate. “Morehouse College is committed to the development of our student cofounders and therefore is committed to sponsoring this initiative for our students to attend SXSW,” said Tiffany Bussey, Founding Director, Morehouse College Entrepreneurship Center. President Obama will give the opening keynote on this Friday. SXSW Interactive 2016 is sponsored by Esurance, Mazda, Monster Energy, Capital One, Bud Light, Deloitte Digital, McDonald’s, Ten-X, United Airlines, Samsung and The Austin Chronicle. Founded in 2013, Opportunity Hub (OHUB) builds diverse & inclusive end-to-end entrepreneurial centers and startups ecosystems from the ground up. OHUB entrepreneurial centers include 10,000 – 25,000 square feet of coworking, incubator and event space. Anchored in education, OHUB’s curriculum is focused on creating new software engineers, technical cofounders and angel investors of color. OHUB is also the vetted seal of authentic diversity and inclusion in the global startup ecosystem, capital markets and beyond. In October 2015, Opportunity Hub merged with TechSquare Labs, a 25,000 sq ft incubator, coworking and corporate innovation space anchored by a $25 million venture fund founded by Dr. Paul Judge and Allen Nance. MVMT50 is a coalition of Black thought leaders committed to sustained and systematic improvement in employment diversity, cultural representation and leadership development in the innovation, technology and digital sectors. MVMT50 represents a dimension of the 21st Century’s civil rights movement, with intent to expand opportunity, elevate the value of diversity and disrupt the traditional culture and practices associated with the innovation sector. Our partners and participants gather annually during South By Southwest (SXSW) Interactive to connect, collaborate and build consensus around disruptive and innovative solutions to empower and elevate Black thought leadership.